Despite demonstrated prowess in the handling of ships and sailors, five years after receiving his commission, Jim Stavridis was planning on getting out of the Navy and going to law school. His assignments officer, a young lieutenant commander by the name of Mike Mullen (who would go on to become Chairman of the Joint Chiefs) noticed something special in Stavridis, however, and convinced him to stay on active duty by dangling the prospect of Uncle Sam sending him to graduate school. Going ashore for a few years, Stavridis earned his MALD and PhD in international relations from the Fletcher School of Law and Diplomacy at Tufts University. The experience that taught him to look beyond the horizon and to think and act globally. Throughout his career Stavridis was anything but uniform in the way he approached his duties. An avid reader and prolific author he wrote more than 55 articles, commentaries, and book reviews in the Navy's professional journal Proceedings beginning when he was still a midshipman and continuing to this day. He has also written for some of the leading papers and journals in the United States, including the New York Times, Washington Post, Atlantic Magazine, Naval War College Review, and many others His career was marked by unusually challenging assignments including command of a U.S. Navy guided missile destroyer in the early '90s; two stints as a top aide to two different Secretaries of the Navy (one a Republican and the other a Democrat); and command of an aircraft carrier battle group. Stavridis narrowly missed being killed on September 11, 2001 when an American Airlines aircraft plunged into the Pentagon not far from his office. He was subsequently put in charge of a Navy think tank, ""Deep Blue,"" which was tasked with reimagining the service's role in a post-9/11 environment. Already selected for his first star as 9/11 unfolded, his rise through the ranks was swift - even going directly from one-star to three-star admiral without ever wearing two stars - when he was selected to be the senior military assistant to the very demanding Secretary of Defense, Donald Rumsfeld. Surviving that crucible, he was nominated for his fourth star at the age of 50, one of the youngest persons to serve at that rank in modern history. He then became the first naval officer to lead the U.S. Southern Command - responsible for all U.S. military operations in the Caribbean and Central and South America. At the end of that assignment he was picked to be the first naval officer to serve as Supreme Allied Commander of NATO - a job first held by Dwight D. Eisenhower and then by a string of prominent generals. When he was given that assignment, the New York Times referred to Stavridis as a ""renaissance Admiral,"" something Stavridis turned into ""the accidental Admiral"" given he was the first sailor to head to that command. 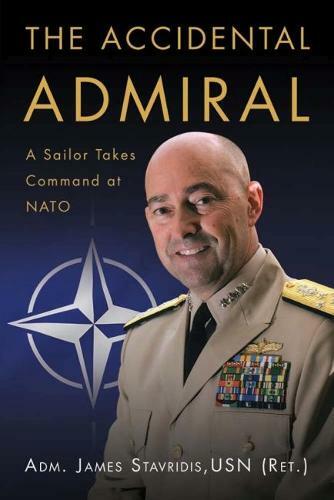 That is where this book, The Accidental Admiral picks up - as Stavridis enlightens readers about securing such a position and serving as NATO's top man in uniform for four years. They were challenging years indeed. Stavridis was responsible for NATO operations in Afghanistan, its conduct of a military intervention in Libya and preparation for possible war in Syria - as well as worrying about the Balkans, cyber threats, piracy, all while cutting NATO by 30% due to budget reductions by the 28 nations of the Alliance. More than just describing the history of what happened, Stavridis shares with reader the ""why"" and gives insights into the personalities of those with whom he dealt, ranging from President Barack Obama; Secretary of State Hillary Clinton; Secretaries of Defense Robert Gates, Leon Panetta, and Chuck Hagel; Afghan President Hamid Karzai; Generals David Petraeus, Stanley McChrystal, John Allen and many more. The Accidental Admiral is more than just a memoir. The book is also a very personal reflection of the burdens and benefits of leadership, and Stavridis also shares his insights on strategic communications, planning, and the convergence of threats that will confront the U.S. and its allies in the near future.